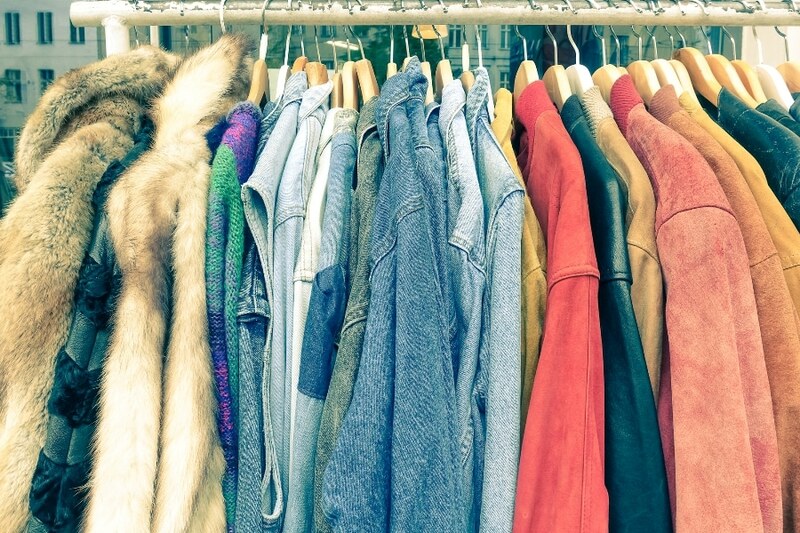 I have no problem with expanding my wardrobe with fashionable finds from thrift stores and consignment stores. What I DON’T like, though, is that the clothes from thrift stores and consignment stores often have a smell. For someone like me who is very sensitive to artificial fragrance and smells, it can be a big problem (and a big headache) when the clothing has a smell from fabric softener or a musty smell. 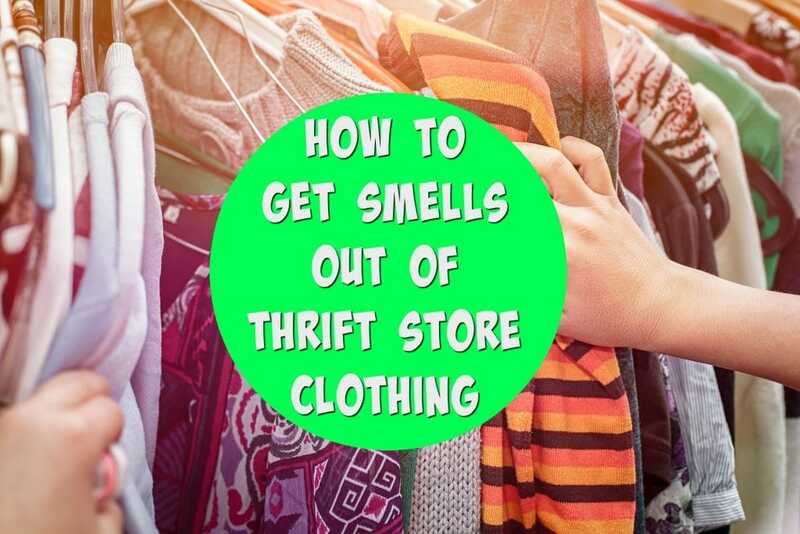 I had to find out how to get the smell out of thrift store and consignment clothes! When you’re trying to get the smell out of clothes, it’s usually something that doesn’t come out in one wash. That’s the easy solution. What you’re looking for is the smells on clothes that seem to linger way after you’ve washed your clothes like normal. When I bought these amazing finds from thredUp in their Clearance section (which I highly recommend, by the way! ), I absolutely loved the clothing when it came, but I got an instant headache from the smell on the shirt. I couldn’t wear it until I figured out how to get the smell out of the clothes. The great answer is that it’s super easy to finally get rid of those smells on secondhand clothing. It doesn’t take too much effort, and you’ll be able to enjoy your inexpensive sustainable fashion finds. This is my favorite trick to get rid of smells on clothes, because it is so super easy. All you have to do is wash the clothes like normal! I used the vinegar trick to get rid of the horrible fabric softener smell that lingered in my washing machine when I moved into a new house. The person that lived there before me obviously liked heavily scented fabric softeners. I DID NOT! It gave me a headache just opening the washing machine. To get rid of the smell in the washing machine, I did 2-3 loads with just hot water and lots and lots of vinegar. It worked! So using vinegar to get rid of smells on clothes will work, too! Add 1 cup of white distilled vinegar (the apple cider kind could stain because it’s brown) to your normal wash cycle, either hot or cold water. It will freshen and deodorize all of your clothing in your normal wash. Smells still linger? Wash the clothing in another load again to remove the smell. Baking soda is a brilliant solution to get rid of smells everywhere. Sprinkle it on your mattress or your rugs to absorb odor and then vacuum off. So you can definitely use it on clothing, too. The easy way to use baking soda to remove smells on clothes is to sprinkle baking soda evenly all over the clothing (This is obviously okay for cotton and polyester, but you should consider doing a patch test with other fabrics, such as rayon or cashmere sweaters.). Laying the clothes on a towel or sheet, then sprinkling baking soda all over the clothing. Add the piece of clothing to a large zip top plastic bag. Add baking soda to the bag, seal and shake to coat the clothes. Leave the baking soda on at least an hour. If you want to leave it on for a few hours, that will be great, too. The power of the sun not only kills germs and dust mites, but it can help bake out odors. Not all clothing is appropriate to put out in the sun. If your clothing is, though, hang it on a clothesline all day in the hot sun. The smell will diminish, if not disappear. 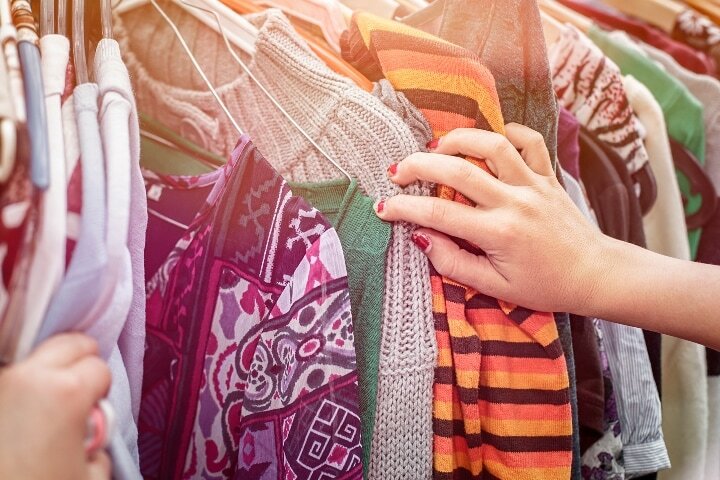 If you are not chemically sensitive to the smells on the thrift store clothes, but you just don’t like them, consider a scented detergent to mask the smell until it disappears. Lots of natural detergents and fabric softeners are scented with plant-based aromas, and could hide the smell. The power of charcoal is unprecedented in naturally removing odor from clothing. Charcoal closet deodorizers are awesome at keeping your clothes fresh. Check out my favorite charcoal closet deodorizers for some ideas. 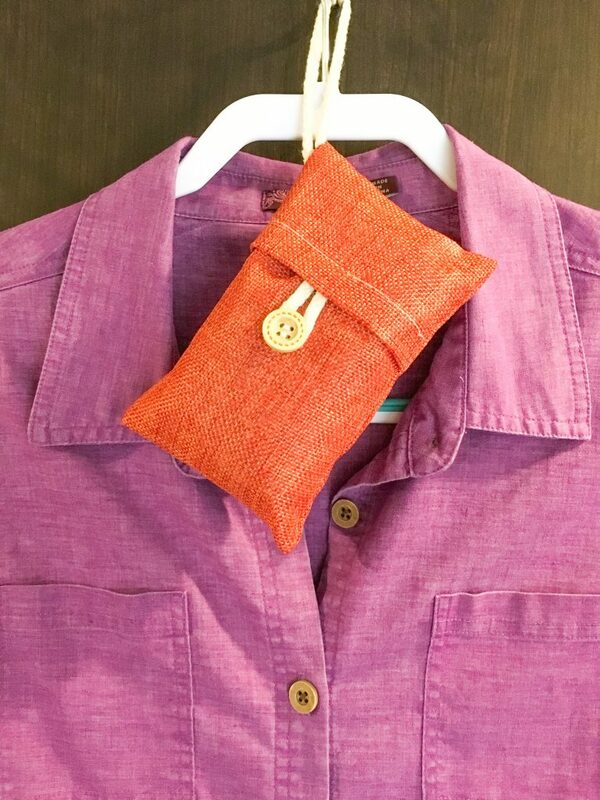 For clothes from the thrift store or consignment store, put the piece of clothing in a bag with a charcoal deodorizer for it to absorb the smell. Large pieces of clothing, such as a wool coat, might benefit from stuffing the pockets with charcoal deodorizers. Also, put the clothing on a hanger and hang a charcoal deodorizer from it to absorb nearby smells. 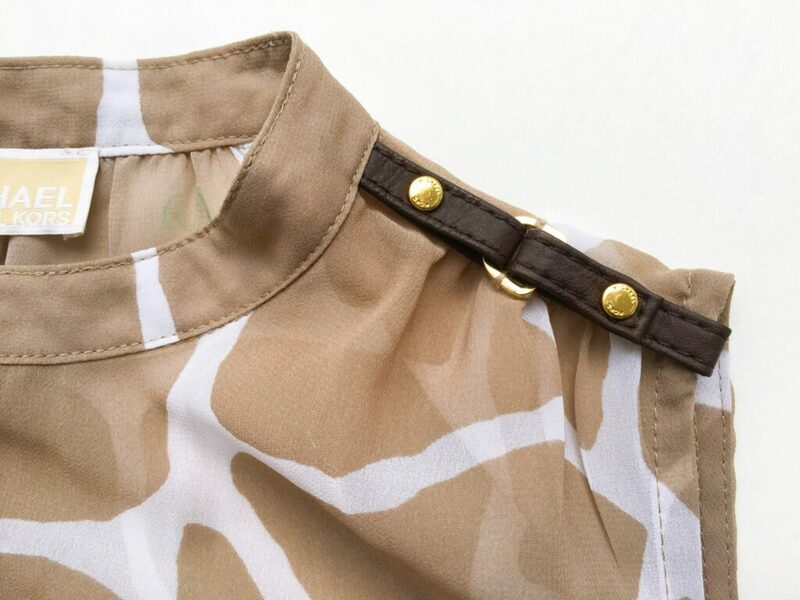 Note: I might not like selling clothes via thredUp’s online consignment store to make money, but I sure did have a positive experience buying secondhand clothes for less on their site. Check out thredUp and see my review on my Clearance section scores.